Tonga is one of the only places in the world where you can swim with humpback whales. Every year from July to October the whales complete their migration from the feeding grounds of Antarctica to the warmer tropical waters of Tonga where they give birth to their calves and perform courtship readying themselves for the next season. The Ha’apai Islands serve as one of Tonga’s most plentiful playgrounds for Humpback Whales. From mid-July to mid-October the Ha’apai Island area becomes one of the largest nurseries in the South Pacific for Humpbacks to birth and raise their young. Join Where Wild Things Roam Travel, in partnership with Diveplanit, for a once in a lifetime experience to witness these enormous and majestic creatures in their natural environment. Where Wild Things Roam Travel joins forces with Diversion Dive Travel and Ha'apai Whale & Sail to take travellers to Tonga to swim with the humpback whales. The Humpback Whales love the Ha'apai Islands, as there are numerous natural protection areas and reefs that provide an excellent nursery to raise the calves. The Ha'apai area is also not overcrowded with whale watch boats, as there are only a few operators in this region and a very large area of coverage (you won't have to wait to swim with a group of whales). Ha'apai Whale & Sail is based at Sea Change Eco Retreat, and operate on the basis of outstanding comfort and absolute safety for the sea conditions common in our area. Sea Change Eco Retreat has fully certified skippers and whale encounter guides who take their responsibility very seriously. Whale encounters depart right from the beach in front of Sea Change. Lunch or an afternoon tea is provided on the boat and you will usually stop for a break at one of the outer island reefs which you can snorkel on. This itinerary is very relaxed and there is no set schedule. Over the period of the 8 days, you will experience 4 days out on the boat with humpback whales. This is weather dependent, so every morning you will be briefed on the arrangements for the day. There is plenty to do on the island on the other days, or you can simply relax. Listen for the distinctive sound of a humpback whale’s spout, or see if you can locate one of the resident sea turtles. Explore the multitude of reefs in the bay just off the resort, or take a walk along the magnificent white palm fringed sandy beach. Enjoy a custom designed exercise, meditation & yoga pavilion which is nestled in a tranquil coconut forest – and book in for a relaxation massage. 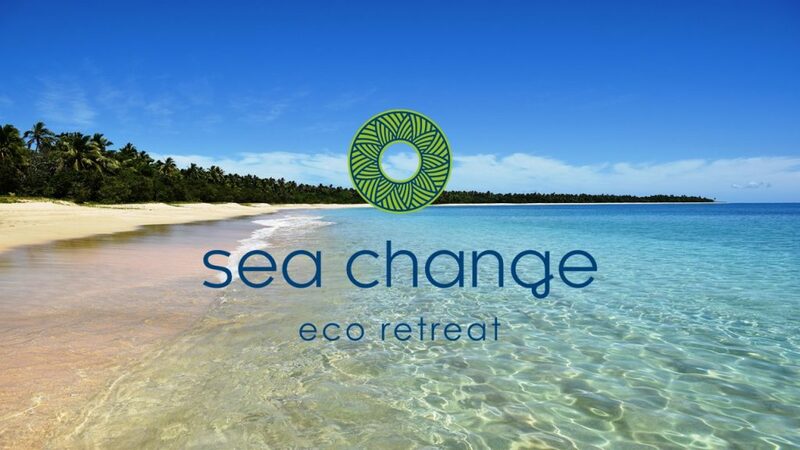 Sea Change Eco Retreat is a boutique resort focused on wellness, adventure, rest & relaxation - located on one of the most beautiful and "off the grid" islands in the South Pacific. The resort is located on the best beach in Tonga, with calm seas that are perfect for swimming. Stay in one of the exclusive, beach front luxury wooden fales or the elevated “glamping” tents. Each comes with a private deck with sea views, garden area and private bathroom which features hot showers. Lie in your private hammock or retreat into the fale and relax on your high quality bed and watch the coconut trees swaying around you with the waves lapping gently on the sandy shore just metres from where you lie. Accommodation at Sea Change is unique and special in terms of our focus on peacefulness, privacy, disconnection from the chaos of the modern world – and most importantly connection to our incredible setting on this amazing island. Our fales (Tongan for “house”) have been carefully designed and well-spaced to provide you with your own private sanctuary tucked just within our natural coconut forests only metres from our beach. This way you can enjoy a stunning view of the sea while keeping cool within the shade of our island forest – and have no idea anyone else is on your island! Each of the fales offer Room servicing as required (eco friendly! ), top quality bedding with either long single or queen mattresses or a combination of both, standard set up is a queen bed in tents and one of each in the wooden fales, a private bathroom with showers, basin/sink and eco-toilet, fresh/clean water from collected rain and solar powered. “Glamping” style tent units placed on elevated wooden platforms with a view of the sea. The spacious safari tent fales are approximately 3.6 metres wide by 2.7 metres long and more than 2 metres tall. Each tent fale comes with a queen size bed as standard. Or two XL single size beds can be requested. They also include a private bathroom with instant hot water showers, basin/sink and a composting toilet – and solar lighting within the tent and bathroom. Our tent fales also have a private front garden area with hammock, and large decks with a table and chairs for relaxing with a glass of wine or playing cards while looking at the sea. The wooden fales have a very large interior living area of 4 by 6 metres, large wooden decks and private bathrooms with basins/sinks, toilets and showers. Each wooden fale features a view of the sea along your own personal pathway to the beach. Bedding arrangements come with a queen size bed. Your round trip transfers from Ha'apai airport to Sea Change Eco Retreat include a short drive from the airport to the boat jetty and an exciting boat ride to the island. While on the island, you will be out on the boat for the whale swimming days. A non-refundable deposit of 25% per person is required within seven days of booking confirmation along with a signed Booking Form. Some tours and arrangements may impose a higher non-refundable deposit - please check at time of booking. Payment of deposit and a signed Booking Form represents acceptance of Where Wild Things Roam Travel Terms & Conditions by the client. Final balance of payment must be received no later than 60 days prior to departure. Where Wild Things Roam Travel uses local ground operators in the country of travel. The standards of accommodation and other services are based on various factors, which are generally accepted as indicated as a certain class. However, we do not represent or guarantee that standard, class or fitness for purpose of the accommodation or service. Where Wild Things Roam Travel does not accept any liability of whatever nature for the acts, omissions or default, whether negligent or otherwise, of those airlines, local operators, shipping companies, hoteliers or other persons providing services in connection with your tour pursuant to a contract between them and yourselves and over whom we have no direct and exclusive control. We do not accept liability for any injury, damage, loss, delay, change of itinerary when required, additional expense or inconvenience caused directly or indirectly by events which are beyond our control, or which are not preventable by reasonable diligence on our part including, but not limited to war, civil disturbances, fire, floods, unusually severe weather, acts of God, acts of Government or of any other authorities, accidents to, or failure of, machinery or equipment, or industrial action (whether or not involving our employees and even though such actions may be settled by acceding to demands of a labour group).